Google recently launched Nexus 5 in the US, and it is safe to say that it matched the frenzy that Apple created with launch of their iPhone and iPads. Infact, in few hours from the it launched on US play store, it sold out. While the official numbers on how many Nexus 5 were sold in first few hours are still not out, it sure will be right up with the iPhones. While Americans were able to get their hands on coveted Nexus 5 device, Indians had to wait and watch (unless they adopted some tricky ways of procuring Nexus 5 in India from US play store). 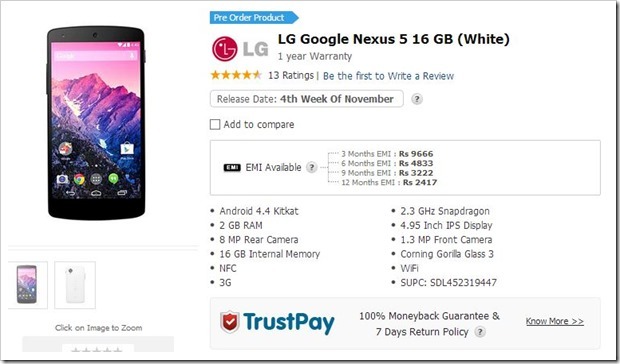 But no more – Snapdeal has now listed Nexus 5 on their portal, much earlier than expected and that too at a same price that Google play store in India is expected to offer. According to the listing, the 16GB Nexus 5 is available for Rs. 28,999/- and what’s more, it is also available with EMI options ranging from three months to one year. Currently for pre-orders, users will need to pay Rs. 999/-, which will be deducted from the whole amount just before the order is shipped to you. Snapdeal will start shipping Nexus 5 from the 4th week of November, which is much earlier than expected. So, if you were worried about buying Nexus 5 from US, you can go ahead and get on the pre-order list as soon as possible, because one thing is sure, there will be lot of demand for this phone! Also, keep in mind, due to very high demand, last week of November may get extended further, so be ready for that. Note: Interestingly, Indiatimes shopping has also listed Google Nexus 5 for sale for a price of Rs. 27,990/- and have mentioned that they have it in stock and will be shipping it in 7 to 11 days! Why Teenagers Are Leaving Facebook & Where Are They Going? Indiatimes Shopping is a horrible site with pathetic deliveries and pathetic customer service.